The number of vegetarians in the UK continues to rise, as more and more people choose the diet for health and environmental benefits. Not only can a diet which excludes meat reduce your carbon footprint, but research indicates that it could avert five to eight million deaths per year by 2050. Jakub Marian created a map in order to showcase some of the vegetarian-friendly (and not so friendly) countries in Europe. 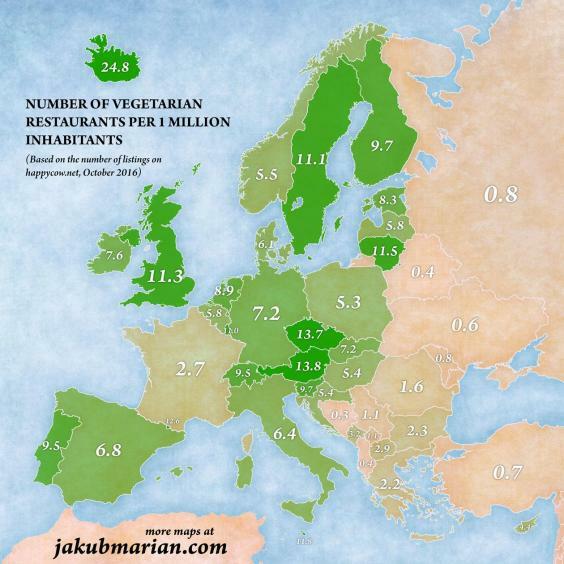 Marian used data from HappyCow, the largest directory for vegetarian restaurants in the world, and plotted their numbers per million inhabitants. This did mean that the data was misleading for countries with a smaller population size, but overall the statistics provide a better understanding of Europe and vegetarianism. Russia, with one of the highest populations, has one of the lowest numbers – with just 0.8 vegetarian restaurants per one million, whereas the UK has 11.3. Iceland has the highest number – with 24.8 restaurants per million inhabitants.